oatmeal lace design: gold, pinecones & glitter! simple holiday wreath under $10. 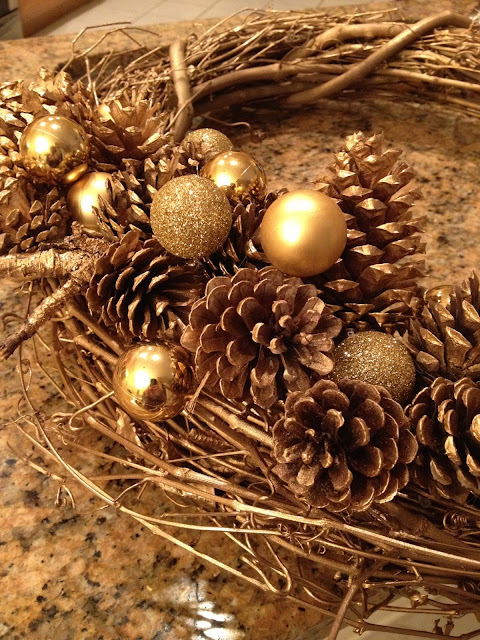 gold, pinecones & glitter! simple holiday wreath under $10. 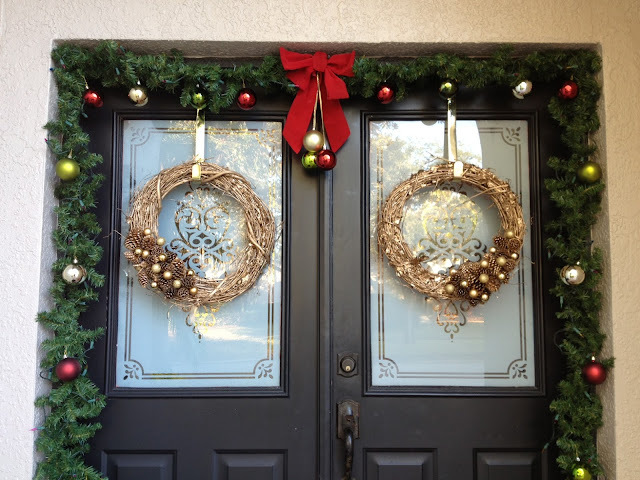 I love my holiday door wreaths SO HARD! glad my first try was less than stellar and forced me to start over. so, I'll share the ridiculously easy process I used to make them. did I take photos of all the steps? no. but you won't need them. it's THAT easy. and did I mention they are less than $10/wreath? score. 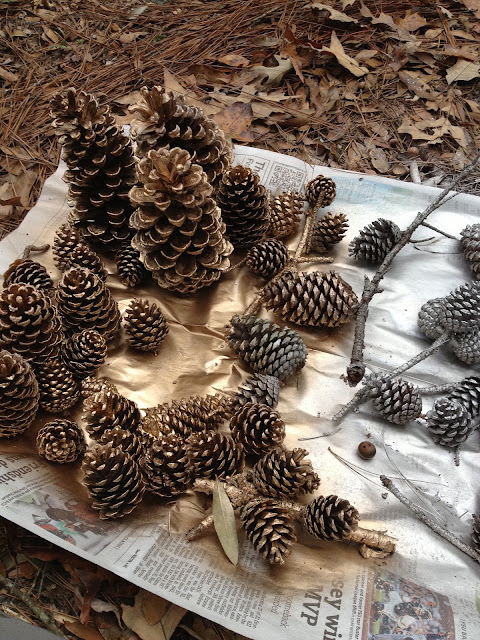 2 : 10-15 small pinecones gathered from your yard (FREE!) or buy a bag at a craft store : COUPON! 3 : gold spray paint - I used the valspar above and it covered well and dried fast! 4 : box of mini ball ornaments. I bought these from joanns and one box was enough for 2 wreaths. but maybe you want to get a little crazy with the gold balls. do it! 6 : forgot to picture it, but you will need a wreath hanger like this one. 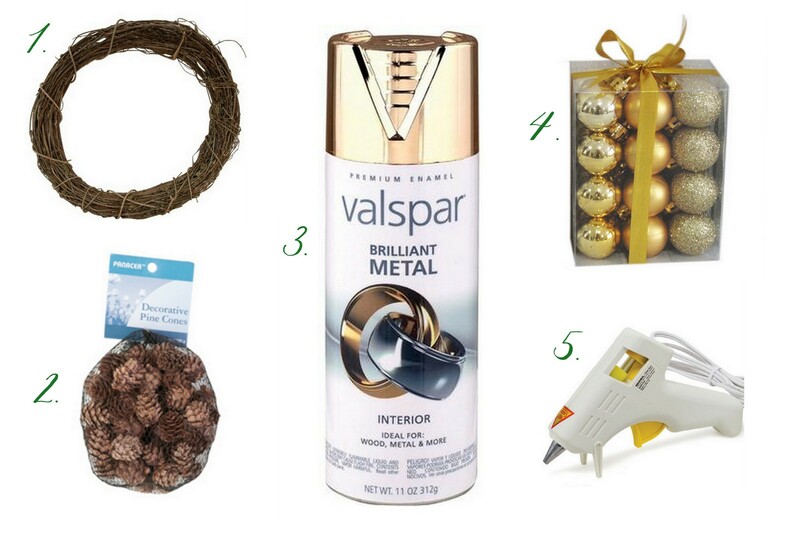 1 : spraypaint your wreath and pinecones gold. you'll have to spray down one side and wait about 20 minutes, then come out and flip them all over to spray the other. ignore the silver paint. that was from the first project and doesn't apply here. love the silver? just replace every instance of 'gold' in this post with silver, or for that matter, whatever color you choose! 2 : once you've gotten everything painted, fire up the glue gun and crack open the box of mini ornaments. you're ready to start playing around with pinecone/ball placement. sounds fun, yes? 3 : after you've figured out placement, glue away! don't be frugal here- you want these puppies to stick, so glob it up. once it's dry you can pull away any excess glue strands that are bothering you. 4 : hang that beauty on your front door and pat yourself on the back. pretty holiday decor in under an hour and under $10. your wallet (and husband) thank you. if you make one, share a link to the photo. I'd love to see what other variations you come up with. How fun! And I love that it's crazy inexpensive. Love the rustic + glitter look! Great job!